>I had a comment on my blog a few days ago from someone who sailed with his family from Washington state, through the Panama Canal, past Cuba and on up the east coast of the US all the way to Maine. The reason I mention this is that he confessed to be a bit of a Jessica Watson junkie and said that he reads her blog every time she publishes a post, which is about every other day. There must be a very large number of folks who could be similarly classified that are apparently following her as her most recent post today had over 800 comments on it. That’s just an amazing number. And all that she wrote about was a T shirt that her mother had tucked away in this week’s food bag. I hope you enjoy Jessica’s video diary from two days ago as she passed the half way point on her trip around the world. She sent this clip from the middle of the Atlantic. I also watched a TV news clip with a commentator interviewing Jessica when he noted that one particularly well known adventurer, Sir Richard Branson had called her on the satellite phone to wish her well. It’s amazing to see how Jessica has captured the world’s attention. A little over 100 days at sea, she’s making great progress. >Spring is right around the corner (sort of). It’s been months since I wrote about Pandora, our SAGA 43 and my plans for the coming season. Now it is February and I haven’t seen Pandora since getting her winterized at Port Annapolis Marina in Annapolis last November. 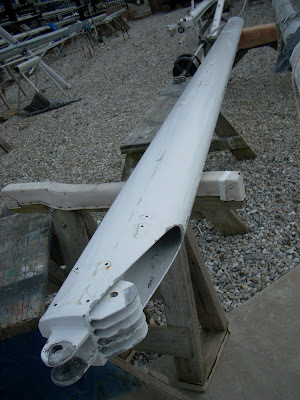 The original plan was for the yard to pull the mast and I would return and strip off the hardware and do some of the prep work to get it ready for the rigger to paint. However, and a big however at that, things got crazy at work and the weather got nasty and very cold. After much wringing of hands I decided to have the rigger do teh whole job. As is to be expected, the job grew in complexity and really ballooned in cost. The good news is that by writing a few painfully large checks Pandora’s mast is almost ready to go back aboard. 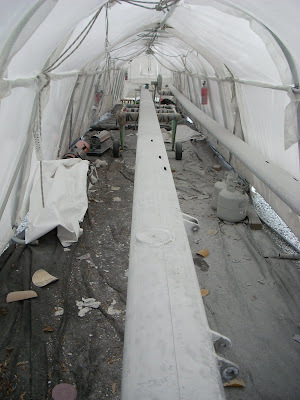 Here are a few photos taken by the rigger prior to getting the mast ready for the paint shop. You can really see just how bad it had gotten with corrosion and peeling paint. It does show what a difference good prep can do for a job. 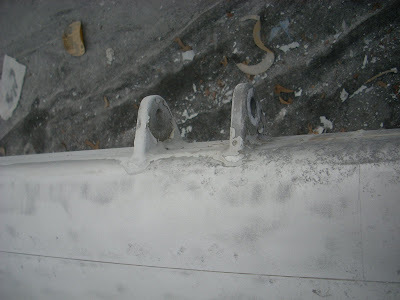 Unfortunately, nearly all of the SAGAs had masts where the builder cut corners on the mast prep and while they looked great at first, over time there was universal peeling of the paint. One more bit of proof that “beauty is only skin deep”. It’s just amazing how many parts are on a relatively simple mast. Notice the coils of wire that are the shrouds and stays. As it turns out, the rigger recommended, and I agreed to, a full replacement of all. After 10 years there was some corrosion on fittings and I guess you can’t be too careful. Painful but perhaps less distressing than a lost rig. 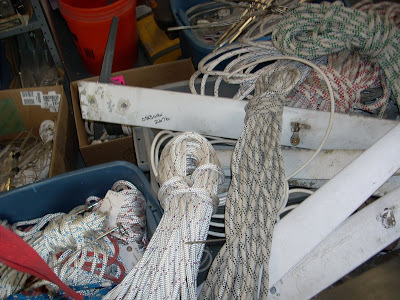 Besides, the insurance company is likely to require replacement of the standing rigging prior to any really extensive offshore cruising down the road. Sailing to the Med anyone? Let’s hope that I don’t remain an armchair voyager for too much longer. Just an amazing amount of corrosion on the mast. This is the gooseneck, the spot on the mast where the boom attaches. Not looking so good. The forward portion of the boom where all the lines run in over shivs. Corroded again. Not too pretty. And, where there is messed up paint there is the potential for metal failure. Getting close to painting, the rig is sanded down to bare metal. A long and tedious (read expensive) process. Lots of man hours in this. I can’t wait to see it all done in a few weeks when I return to begin the prep for splashing in late March. I also need to have good cell coverage when I am aboard and the signal is often a bit weak where we sail. However, there’s a solution. I found a company that sells a cell phone booster that can pick up and improve a signal dramatically for both receiving and transmitting as long as there is at least a weak signal. The system involves an antenna at the top of the mast and a amplifier at the navigation station in the boat. There are two versions, one that is hard wired to a phone, through an external antenna jack, and another that works through a local wireless network on the boat. According to the tech folks the hard wired version will work up to 50 miles from a tower and the wireless version up to 20 miles. I have opted for the hard wired version and will purchase a cable to connect my phone to the unit directly. I am hopeful that this system will allow me to get my ;phone service and data virtually anywhere we are in normal coastal cruising. This link will take you to their home page. If you’ve had any personal experience with such a unit, I’d love to hear more. It’s worth noting that ordering this was quite a pain as they only sell through dealers, more like local installers or places that didn’t know marine, and getting any of them to return my call or understand what I was looking for was very tough. I finally called West Marine and they were able to special order the parts I needed. Wish me luck. >I couldn’t resist putting up this video that landed on YouTube today just a few minutes prior to my searching for for the latest updated videos on Abby Sunderland’s departure from Marina Del Rey on Saturday as she left to begin her around the world voyage. This video only had one viewing prior to my picking it up this afternoon. It’s quite well done and better than some of the others that have gone up. I hope you enjoy it. Do you think she is too young? You be the judge and let me know. Now there are three solo sailors making the run around to the east, one from India, another from Australia and now from the USA. It will certainly make for interesting viewing over coffee in the morning. >Jessica Watson gets knocked down four times! >Young Jessica Watson from Australia survived a storm two days ago in the South Atlantic where she was knocked down a total of four times, once where her mast went to 180 degrees. Aside from some bumps and bruises, she came through just fine. As you can imagine, there was also some damage on deck as this picture that she posted shows. I think it’s amazing that her boat came through in such great shape, Jessica too. Check out her blog post, it’s amazing to read. Equally impressive is that after 100 days at sea Jessica’s blog continues to get a lot of traffic. As of 8am on Sunday morning EST he had 400 comments on her post. That’s a powerful demonstration of her following. Actually she is a good writer and recall, that she is only 16 years old. After a day with winds at hurricane force, Jessica is now sailing along with very calm conditions. The change in weather does certainly bring the phrase “what a difference a day makes” into sharp focus. Happily, Jessica can continue on her voyage as planned. You can also see where she is now, (this link is best viewed with Google Earth installed on your computer) just north east of the Falklands where the Indian Sailor Dilip Donde is refitting prior to setting out on the next leg of his around the world voyage as well. He’s sailing from Mumbai India. This video is from a BBC segment that provides some context to the power of waves, and rogue waves in particular. Jessica experienced conditions that were probably less severe than the biggest ones shown here but devastating, none the less. The power of water is must immense. As I look at this and Jessica’s photo, it is clear to me that my dodger and bimini would definately not survive this sort of punishment. While Jessica is making her way, Abby Sunderland left on Saturday from Marina Del Ray in California on her boat Wild Eyes with the hope of becoming yet another, and perhaps the youngest, to make it around unassisted. Abby’s blog post from yesterday also notes that there will be a segment on Good Morning America on Monday morning about her voyage and departure. Well, another journey for me to follow. Lot’s going on in the world of solo sailing these days. >Jessica Watson and Dilip Donde both safely around The Horn! >Yesterday Jessica Watson rounded Cape horn earlier this week on her quest to be the youngest unassisted circumnavigator. Actually, in the last week, two sailors have made the rounding including Dilip Donde with the Indian Navy. Dilip beat Jessica by a few days, coming up from behind in a larger and faster boat. Also, Jessica was trying to make her rounding in daylight in order to allow for a flyover by her parents in a small plane. They had flown out from their home in Australia in time to fly over Jessica and speak to her over a VHF radio. I recommend that you read her post on this event as it is quite touching. Imagine that she has been alone at sea and passing The Horn was her first land sight in months. She left home aboard Ella’s Pink Lady in mid October. Combine that with being in the “vicinity” of her parents who circled overhead for 45 minutes before heading back to land and you can certainly imagine how emotional it was for everyone involved. There was a video from her parents on her site earlier today but it seems that they have pulled it down, perhaps to do more editing. Who knows. Here’s a video Jessica posted as she rounded the fabled rocky point at the very most southern tip of South America. It’s obvious that she was very excited when she made this video. Still a long way to go but passing The Horn is such a major milestone. This video shot by Jessica’s parents while they circled overhead is very touching. Imagine how they felt being so close and yet not able to actually be together. The dialogue between Jessica and her mother is quite touching. The boat looks so small on the big, bad southern ocean. Stanley, Falkland Islands. It’s short but worth a look. It seems he will be there for a while and will then head out to continue on his journey. What a great trip.